If the midwest is America's breadbox, California is its orchard. The Golden State produces nearly half of America's fruits, vegetables and nuts—more than 400 varieties—an output valued at more than $43.5 billion each year. But the energy needed to grow, harvest, process, and ship this bounty is no small sum. That's why one ingenious farmer is powering his operation using already produced shell waste to zero out his electric bill. 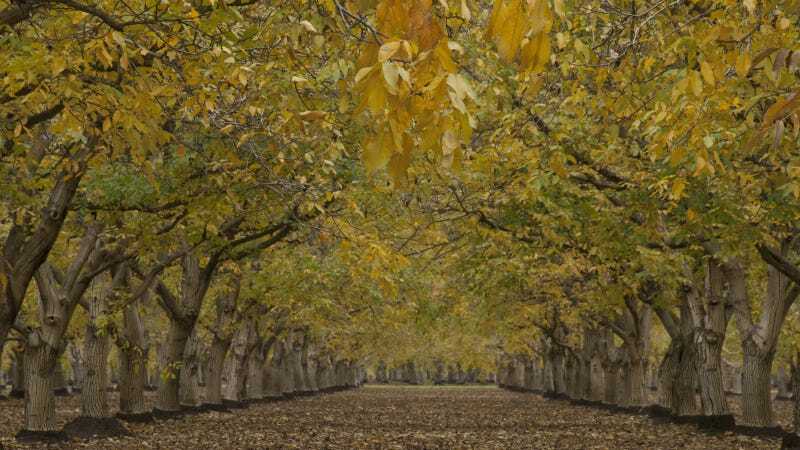 Walnuts, like those grown on Russ Lester's Dixon Ridge Farms in Winters, California, are some of agriculture's most energy-intensive crops given the amount of product you get from them. The inedible shell constitutes 50 to 60 percent of each nut, and has conventionally just been discarded. On Dixon Ridge's 400 acres, that translates into about 2.5 million pounds (more than 1200 tons) of shell waste annually. But rather than pay someone to dispose of these shells, Lester instead converts them into syngas using a cadre of downdraft gasifiers built by the Community Power Corporation of Englewood, CO. Known as the BioMax, these machines can transmogrify a variety of woody biomass, and even some plastics, into nitrogen-diluted syngas. This includes everything from wood chips and pellets to orange and grape skins, cardboard and product packaging to kitchen waste and plastic utensils. Anything with less than 25 percent moisture can undergo gasification. The BioMax system relies on pyrolysis (greek for "fire separation") to convert biomass into syngas, the same process used to make charcoal. Organic material is placed in an anaerobic environment and heated to a minimum of 200–300 degrees C. This causes the material to separate into gas and liquid components, leaving a solid residue of char. In the BioMax system, the resulting gas is a mix of ~17 percent hydrogen, 20 percent carbon monoxide, 8 percent carbon dioxide, 2 percent methane and the remainder nitrogen (all of which can be separated, bottled, and either used on-site or sold). It also leaves behind char-ash, a carbon-rich fertilizer. What's more, this char-ash is created from some of the CO2 produced by the process, resulting in a net-loss of carbon. Lester’s first attempt at running his farm on alternative energy involved a BioMax 50 generator supplemented with solar power. While most of the gas was put toward electricity production to help power the farm and production facility, some was diverted for use as an alternate fuel to the propane employed for drying the nuts after they'd been washed. Just doing that allowed Lester to shave nearly $75k off his annual power bill. Last winter, Lester installed another pair of larger BioMax 100 generators to supplement his existing system and further reduce the amount of shell waste his farm produces. He expects to save about $250k on energy expenditures this year alone.